Guild Wars 2's sizeable expansion, Heart of Thorns, is now available, adding new zones, character abilities, PvP features and much more. For competitively minded folks there's the 'Pro League', which we interviewed ArenaNet about earlier this month. 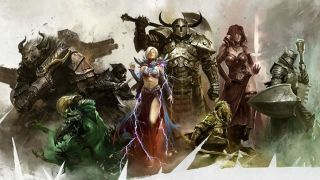 It marks a serious push to turn Guild Wars into an e-sport, with a focus on player skill rather than grinding for gear. The same goes for PVE players, with the new 'Mastery' system overhauling how endgame progression works. Apparently it 'does away with the traditional gear and level grind that leaves a content wasteland and widens the gap between new and veteran players', instead giving you specific 'exciting' goals to work towards. Looks like the Guild Wars team were ahead of us in taking some lessons from Destiny's endgame, which I can testify is a great improvement over the traditional grindfest. Then there are the new enemies, areas and specialisations, as well as the eagerly anticipated Revenant profession. They're a tanky melee class by trade, who can channel their ancestors into various Mist attacks. I'll let Arenanet give you the full rundown. And finally, there's the raids. You can read more about how they'll work over here. If you're not interested in the new stuff, you can play the base game for free. There aren't even any pesky micro-transactions.